The week we visited, the plant received its last-ever shipment of ferrous chloride, making it completely chemical-free on the liquid side. Other recent installations are two energy-efficient blowers that earned the plant a $39,000 rebate from Consumers Energy and a heat-trapping system that transfers otherwise wasted energy from one building to another. 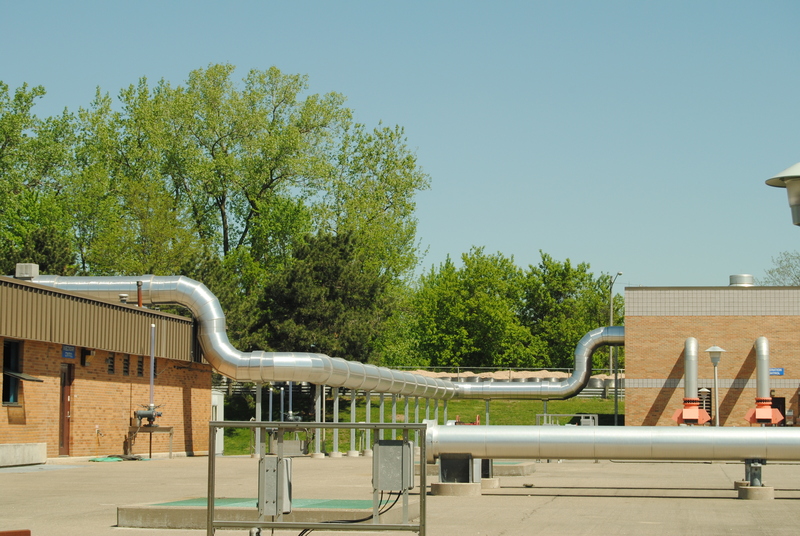 Waste heat from one building at the Grand Rapids plant is used to warm another. 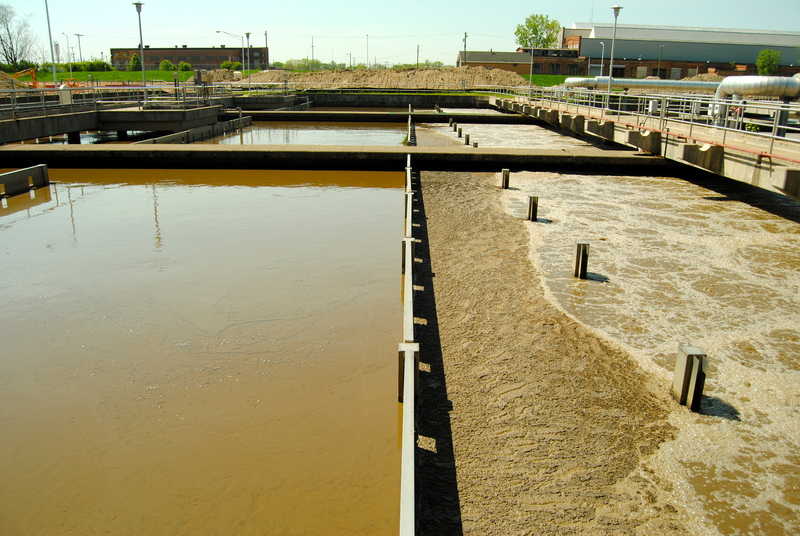 In the first few steps of the treatment process, the wastewater (the water and other things flushed down your drains) flowing into the plant is slowed down so gravity can go to work. The ‘sludge’ (feces and other solids) sinks out of the water and the ‘scum’ (soap residue, oils) is whisked off the top. Later, ‘bugs’ such as nitrifiers and PAOs (polyphosphate accumulating organisms) clean nitrogen and phosphorous from the water—no need for chemicals. Grand Rapids’ wastewater treatment plant is now chemical-free on the liquid side. According to Nick Occhipinti, Director of Policy and Community Activism at the West Michigan Environmental Action Council (WMEAC), the Grand Rapids attitude toward sustainability can be traced back to the city’s origins as a world-class manufacturing center. Major furniture companies and firms like Cascade Engineering have always competed to have the leanest, most efficient operations. Today, this stewardship ethic serves a new, additional purpose as the City prepares for the more frequent and intense storm events that will come with climate change. 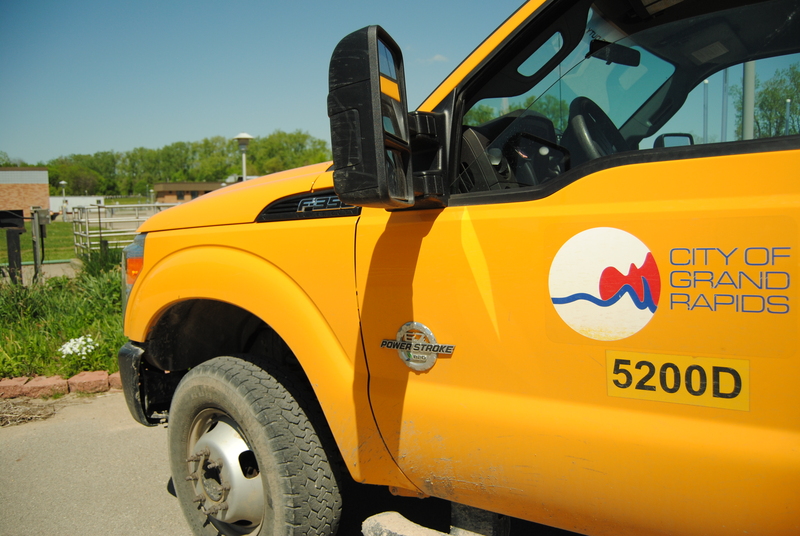 In mid-April 2013, the biggest flood in recorded history put the low-lying wastewater plant at high risk of inundation, which would have led to a plant shutdown and billions of gallons of raw sewage rushing into the Grand River. So, the ESD team quickly responded by lining the entire plant perimeter with $400,000 worth of heavy duty bags of sand and by moving some key pieces of machinery offsite. 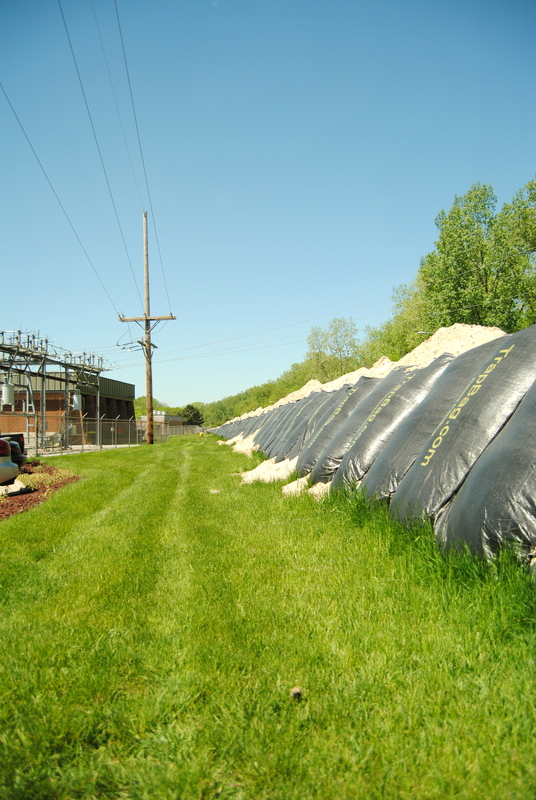 Sandbags protected the wastewater treatment plant from the overflowing Grand River during a recent flood. After a number of flooding events, the State of Michigan in the late 1980s mandated that Grand Rapids separate its wastewater system from its stormwater system to reduce the risk of overloading the plant and sending raw sewage—also known as combined sewage overflows—into the river during big storms. (Stormwater is the water from rain events that flushes through streets and fields. It gathers oils, fertilizers, and sediments along the way and can be quite polluted). The system separation is nearly complete. According to Occhipinti, while separating the sewer system from the stormwater system is a huge success story, it also creates a new challenge. Whereas before most urban stormwater runoff was treated in the wastewater plant during typical wet weather events, it now flows untreated into the Grand River, carrying with it oils, fertilizers, and other pollutants it picks up on city streets. The sewer separation therefore creates a need for more and better green infrastructure to keep dirty stormwater from contaminating the Grand River. The WMEAC office building leads by example, creating zero stormwater runoff through its green roof and rain garden. 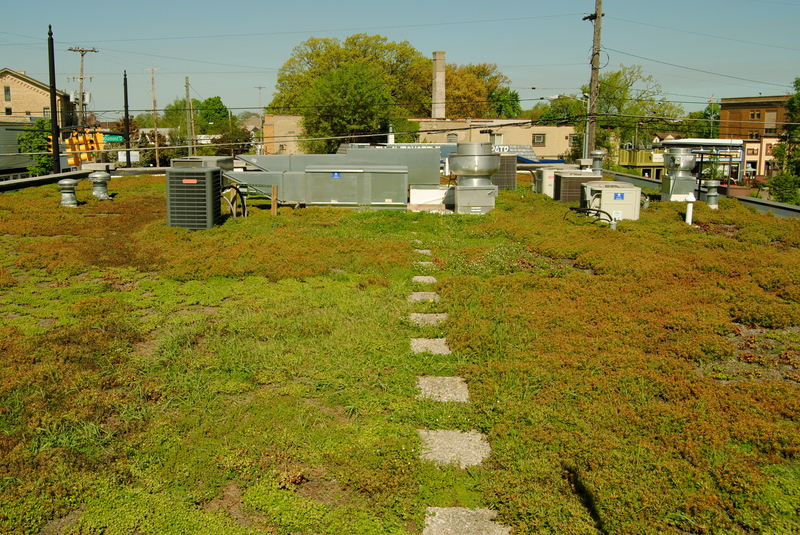 West Michigan Environmental Action Council’s green roof helps the building produce zero stormwater runoff. “For a moment, we were the greenest office building in the country,” said Nick Occhipinti. The wastewater plant is also doing its part. Three onsite rain gardens, composed of mainly native Michigan species, help divert over 1.5 million gallons of untreated stormwater every year and protect the plant against flooding. These rain gardens cost less than traditional technological solutions. Not to mention, they’re pretty. The ESD’s proactive drive to improve the plant’s efficiency and resiliency is apparent more generally in Grand Rapids. A 5-year Sustainability Plan serves as the City’s blueprint to maximize the ‘triple bottom line’—or improvements on economic, social, and environmental fronts. All City departments came up with their own targets—ones directly tied to the City’s outcomes. The target-driven Plan, directly tied to the budget, allows Grand Rapids to publish an annual progress report that tangibly quantifies their progress. “If you micromanage the sustainability planning process, it won’t work. It works better when the staff is empowered to deliver sustainability outcomes,” Haris Alibašić, Director of the Office of Energy and Sustainability, said. 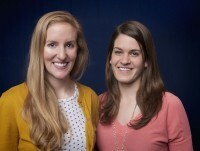 The ESD is a prime example of the kind of department that thrives when encouraged to use their creativity. Lunn attends water quality fairs to learn about the newest technology and is constantly looking to save money and energy at the plant. We asked him why all wastewater treatments plants aren’t doing the same. Interesting! You may also want to think about a visit to Dubuque, IA, to follow up on a 2011 Scientific American article (Carey. J. A. 2011. After the Deluge. Scientific American Dec 2011: 72-75) that mentions similar themes. Thanks for keeping us all posted and most of all inspired!! !